...s, including the UNESCO-awarded Wat Prayoon. Admire the view of the Chao Phraya River, the biggest waterway in Bangkok. 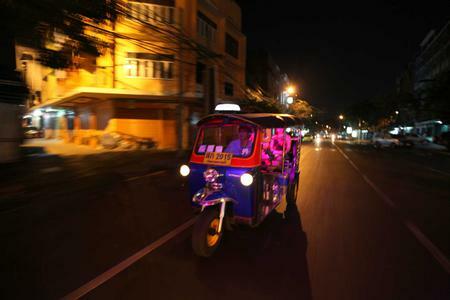 ...ople per tuk tuk. Place visited : Klong San Market, Wat Prayoon, Memorial Bridge, Giant Swing, Wat Pho, Flower Market. 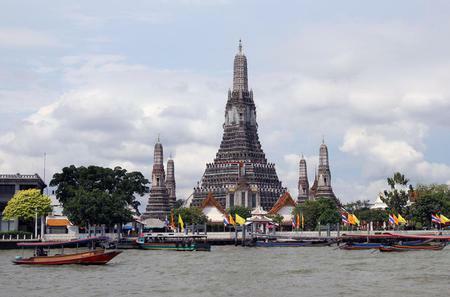 This temple is close to the banks of the Chao Phraya River. This temple is close to the banks of the Chao Phraya River. 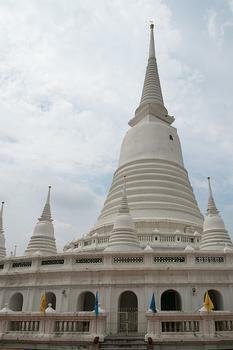 The first thing you see is its large white chedi in Ayutthayan style; it is the only chedi of this style in Bangkok. King Rama II tried to create a similar chedi at the Golden Mount, but the ground could not support it and that chedi collapsed. If you want a nice nightly picture of the chedi, walk on the Memorial Bridge at dusk when the chedi is beautifully illuminated. However, most visitors come from the Khao Mor Cemetery, a large mound at the entrance of the temple. The mound is covered with many different shrines, chedis, spirit houses and even a doll house. Another attraction is the small museum with only two rooms, having Khon masks, papier-mache pigs and other cultural objects on display.